In light of how far the rest of the country has come, this seems like very small potatoes. But at least it's a step in the right direction. 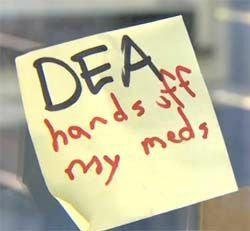 The DEA raided several medical marijuana dispensaries in Washington State yesterday. One had only been open a month. Casey Lee, an employee at the Bayside Collective, said DEA agents served him with a search warrant and seized about "11 or 12 plants Wednesday morning. They also took marijuana in jars that is set aside for patients. He said the seized marijuana totaled about a quarter pound. The DEA agents seized his and another employee's cell phone, Lee added. Fellow Bayside Collective employee Addy Norton said she was "terrified" during the raid, and DEA agents pointed guns in her face as they entered the building. R.I.P., Richard Flor, a 68 year old medical marijuana dispensary owner who has died in federal prison. The story will make you sick. US District Court Judge Charles Lovell sentenced Flor to to 5 years in federal prison despite testimony that he was suffering from a variety of illnesses, including dementia, diabetes, hepatitis C, and osteoporosis. Lovell did recommend that Flor "be designated for incarceration at a federal medical center" where his "numerous physical and mental diseases and conditions can be evaluated and treated." On multiple occasions while in custody, Flor had fallen out of bed breaking his ribs, his clavicle and his cervical bones as well as injuring vertebrae in his spine. Flor also suffered from dementia, diabetes and kidney failure among other ailments,. In what appears to be a first nationally, a malpractice insurance carrier has refused to renew Denver lawyer Ann Toney's policy because she advises medical marijuana businesses. In its terse notice, the Hanover Insurance Group explained that Toney's practice "does not meet current underwriting guidelines because of the following risk factors: Area of practice involving medical marijuana." The Colorado Court of Appeals has ruled persons on probation may not use marijuana, even if they have a valid state license to do so. The opinion is here. The Weed Wars continue. Here's the U.S. Attorney's press release on yesterday's California medical marijuana dispensary raids. DOJ's "justification" for the raids is in this earlier press release. The California Supreme Court has agreed to hear two medical marijuana cases. The California Supreme Court has jumped into the fray again over the legality of medical marijuana laws, deciding on Wednesday to review two lower court rulings that impact how and whether local governments can regulate pot dispensaries across the state. In their weekly closed-door session, the justices voted unanimously to review cases out of Long Beach and Riverside that dealt with the ongoing conflict between California's voter-approved law allowing the use of medical marijuana and federal laws barring the use or sale of the drug. The state Supreme Court's rulings in the cases are likely to have a widespread impact in the Bay Area, where cities from San Jose to Oakland have regulations dealing with medical marijuana providers. 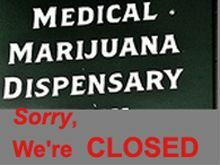 Colorado U.S. Attorney John Walsh has been busy filling in names to his latest form letter, warning 23 Colorado medical marijuana dispensaries to shut down within 45 days or face forfeiture of their businesses and any financial proceeds generated, as well as enhanced criminal charges. The reason: The dispensaries are operating within 1,000 feet of a school, in violation of 21 U.S.C. § 860(a). The letter is here. The press release is here. Similar letters were also sent to the landlords of the businesses and property owners. Landlords were warned about 21 USC 856(a). "The Department of Justice has the authority to enforce the federal law even when such activities may be permitted under state law." 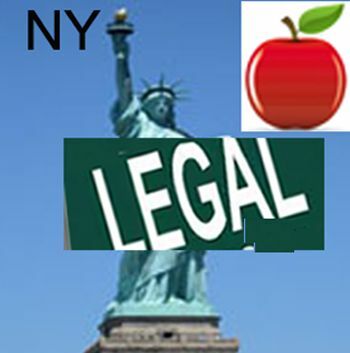 ....In recognition of the potential medicinal value of medical marijuana, make a request by January 1, 2012, to the federal Drug Enforcement Administration to consider rescheduling, for pharmaceutical purposes, medical marijuana from a schedule I controlled substance to a schedule II controlled substance. Via Huffington Post and NORML, here's the letter signed by 9 members of Congress asking President Obama to stop the raids on medical marijuana businesses. It is our strong position that local and state governments must be allowed to develop, implement and enforce their own public health laws with regard to medical cannabis," the letter stated. Roshaja Harvey was found to have violated the terms of his supervised release for using marijuana. Harvey appealed, contending that because he had a doctor's recommendation to use marijuana in California pursuant to the California Compassionate Use Act of 1996, he did not violate the possession prohibition of the Federal Controlled Substances Act. He also argued a doctor's "order" was different than a "prescription." Whatever else “order” might mean under § 844(a) of the Controlled Substances Act, it does not include a mere recommendation from a physician pursuant to the Compassionate Use Act. More people voted to retain MMJ businesses than voted for any member of the City Council. Another first for Colorado: The Medical Marijuana Enforcement Division of the Department of Revenue has issued its first licenses to medical marijuana businesses. 11 businesses received the licenses and 7 have been notified they are next. 467 are in the final application phase. Colorado is the first state in the nation to license marijuana dispensaries and infused-product businesses. Medical-marijuana advocates say Colorado's regulations for cannabis businesses are the most comprehensive in the nation, and they credit the rules' thoroughness with shielding the businesses from federal raids.